I have shared with you all many times before, that I sew on a Bernina sewing machine. And also that Bernina has graciously allowed me to use one of their machines for all of my projects. And the first of my projects can be found over there today. 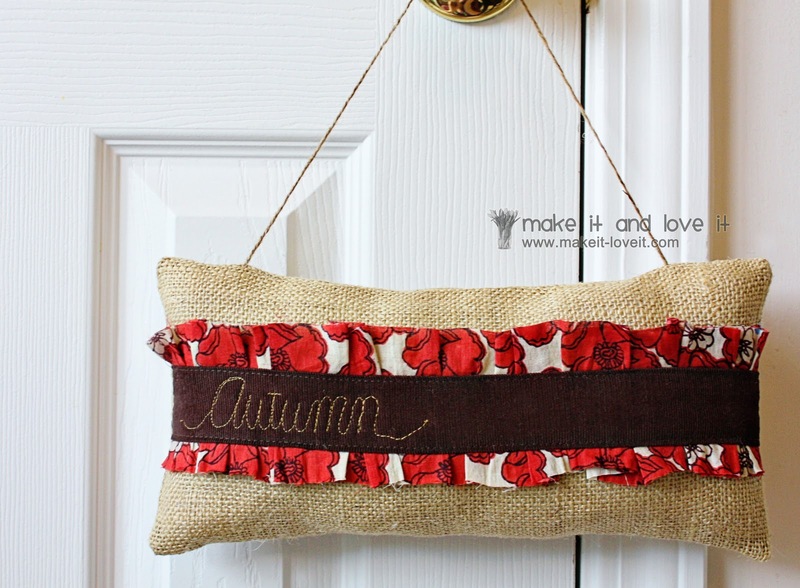 It’s a sweet and simple autumn door hanger that I whipped up several weeks ago. And the key word is whipped up. This project is pretty quick and can easily be made during this last week of autumn decor. Especially if you’d like to add a few touches to your home before all of the company comes for dinner next week. A great use of some of that rugged burlap, mixed with some sweet flouncy ruffle. With a quick machine-stitched “autumn” right on the front. See that little beauty at work? I used the free-motion stitch on my machine but remember that you can create block letters and use your regular stitch as you slowly stitch out the letters you need. This project is very versatile though. You could even turn the idea into a non-holiday door hanger and write an inspirational word or two on the front. And then hang it right on that door knob. Click here to find the full tutorial for the autumn door hanger. Awesome! I need to do "joy" for Christmas to give out to relatives, since my maiden name is Joy. It would be perfect. So cute! Looks like something I can manage! Thanks! By the way, where did you get that cute floral fabric? I'm off to see your tutorial. What a great job on the word Autumn. I have tried to spell things with my sewing machine and I know I will need A LOT more practice. The entire pillow is very nice. I'm envisioning this with the words "sleep tight" for my guest room. Thanks for the idea! Looking forward to being able to design my own shapes to apply to the bags I make. Very exciting. The fabric was just some cotton that I cut off a store bought dress. So I have no idea where it came from. Ha! I love this and have been staring at the photo I downloaded as my display screen photo… I thought of an extension of this original idea. Make a ribbon and embroidery word for all four seasons and afix with velcro. this way it can be changed every three months. I hope to make one for each of my closest neighbors for Xmas this year.